Bill's OBX Beach Life: What Could Have Been....An Epic AWT Hatteras Event! 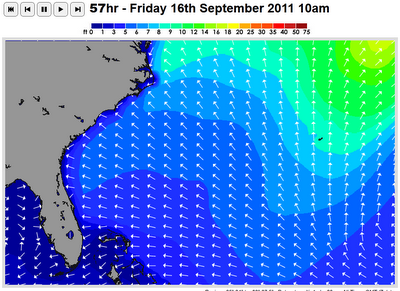 What Could Have Been....An Epic AWT Hatteras Event! 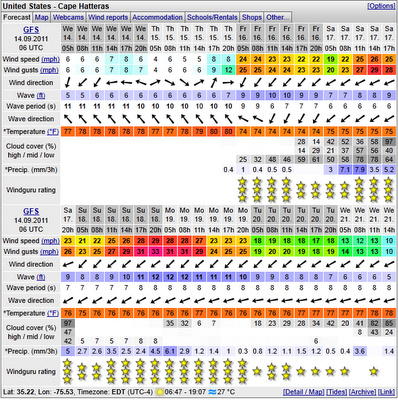 Wow, what a forecast coming up and aligning perfectly with what would have been the second half of AWT Hatteras Wave Jam event window. SE tropical swell from TS Maria complemented by a strong NE wind forecast is primed to set up likely the best southside wavesailing conditions of the year! Smack dab in what would have been the AWT Hatteras Wave Jam event window. Imagine, the largest contingent of professional caliber wavesailors ever to visit the US East Coast, "all eyes" media coverage, and epic surf and side-off wind conditions....! Simply would have been awesome!! Additionally, to fall on the weekend as well would have opened the floodgates for regional participants and spectators to make a long weekend run to Hatteras to witness the action and enjoy the show! The forecast calls for NE wind in the upper 20s/low 30s mph range and 8 ft to 10 ft SE swell; the pros would have been on fire and really set Hatteras wavesailing on the international stage! Hurricane Irene, An Eye Wall View?! Lake Atlantic, The End is Near?! AWT San Carlos Cactus Cup Success!! 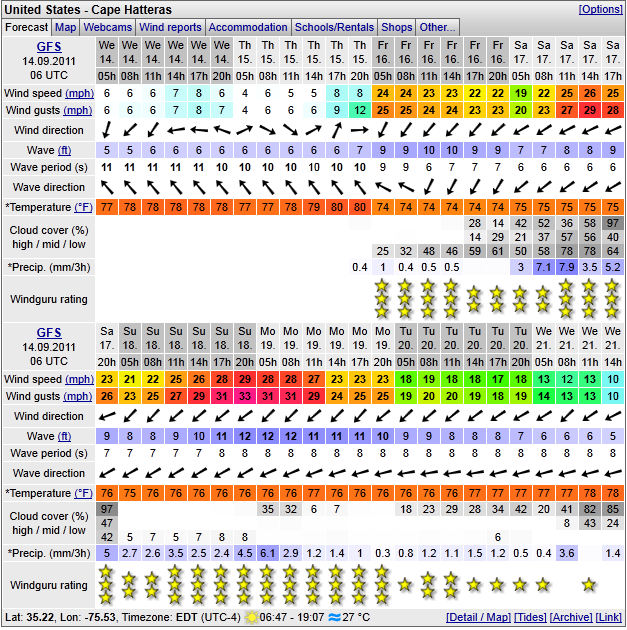 Weekend Wind and Surf at the Stump! Windy SW in Hatteras but FLAT Atlantic!